Fifty years ago, as a student in Cambridge, I met David Wilcox in the Robert Hall Society, where Baptist students gathered. After Cambridge, David was a Baptist minister for many years, before becoming an Anglican. Last September we met again in Cambridge at a reunion for people who had been in Robert Hall Society around 1960. I found out he was now Priest Vicar at Wells Cathedral, a long way from Leeds. So I did not expect to have more contact with him. A bit later, I got a phone call from my brother-in-law, Spencer. He goes to Wells Cathedral quite often as he used to go with his wife, Joy, until she died last year. He met David and they got talking and found they both know me. Spencer then sent me a copy of this sermon preached by David earlier this year. It is good in at least three ways. First, it is beautifully crafted, so that it is clear, short, full of stuff, and to the point. The craft makes it memorable, which is important if a sermon is to go deep and stay with us and be fruitful. The craft which makes it memorable is in the simplicity of its structure, the motifs of light and salt running all the way through. Secondly, we hear Jesus in this sermon, calling us to be salt and light. Thirdly, what it is to be salt and light in the world is illustrated from the life of Dietrich Bonhoeffer. Eberhard Bethge, Bonhoeffer’s friend, wrote a huge richly informative biography, nearly a thousand pages long. But here we have the life in two pages, not long enough for anyone to get weary, even if they are sitting uncomfortably on cathedral seats. As a brief account of Bonhoeffer’s life and witness I think this is quite outstanding – it does not merely outline the history but makes it a challenge and encouragement for us today. 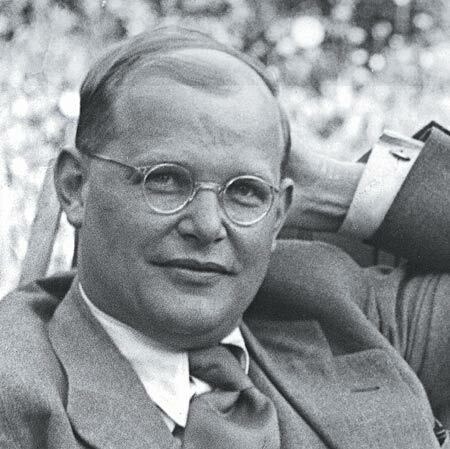 On 9 April 1945, at Flossenburg concentration camp, Bonhoeffer was hanged for his share in the resistance to Hitler. So this week it is fitting to publish it, to remember him, and to hear again for ourselves on our 9 April 2011 the call to be salt and light in the world. Today is an ordinary Sunday. Last Wednesday was Candlemas, and at Evensong we said “Goodbye” to the festival season of Christmas and Epiphany. For the next five or so weeks we journey through Ordinary Time until we reach Ash Wednesday. So who are these people? The introduction to today’s Gospel reading tells us that they are disciples of Jesus of Nazareth who have joined him on a mountain. We are hearing part of the Sermon on the Mount. What we aren’t told is that Jesus has just declared these followers of his blessed by God.,- blessed , not because they are rich, happy or or successful, but blessed because they are poor in spirit and meek; blessed because they mourn over the injustice and wrong in the world and hunger and thirst to see righteousness prevail; blessed because they are merciful, peacemakers; blessed because they are totally committed and ready to stand up for what is right, even if it means suffering and persecution. In one sense they are the ordinary people of Galilee. But in another sense they are extra-ordinary, because they have been seized by Jesus’ vision of God’s realm of justice and peace, healing and reconciliation, and with him they want to make it real. They are beatitude people. Behind this group of Jesus’ followers on the mountain stands another, the church community for whom the person we call Matthew wrote this gospel. Jesus’ words address them. To them he says, “You”. And behind them are more and yet more, generation upon generation of people, young and old, right down to today. All over the world you will find them, in Cairo’s Tahrir Square, in the ruins of Port-au- Prince, in the crowded streets of Seoul. Notice, “You are”, not “You ought to be”. This is the essence of your being as beatitude people. And notice, “Salt of the earth, light of the world.” This is not about religious escapism, but about getting stuck into the nitty-gritty of the world in which we live. So what does it mean to be salt, to be light? Salt,- tiny crystals. Dissolve them in water and the flavour is transformed. Soak fish or meat in brine and it keeps for months. Salt makes a difference, hidden but real. And that is what you are; people who transform the world from within, by your presence where help is needed, by the way you handle relationships, by your readiness to take constructive action without anyone else knowing about it. Of course sodium chloride can’t lose its taste. But two thousand years ago it was easily confused with gypsum and came mixed with impurities,. That points to the danger, that we melt so imperceptibly into the world around us that we stop making a difference. We are called to add the savour of the beatitudes to human relationships, and to help preserve what is good and right and fair. Salt. And light,– a flickering candle flame. But place it prominently in a darkened room and it will shed its light to the furthest corners. If the picture of salt is about working imperceptibly from within, then the picture of light is about being visible, not hiding our light under a bushel basket but speaking and acting clearly for truth and righteousness and peace. A letter to government official about a prisoner of conscience, an event to promote the welfare of impoverished people, a peaceful demonstration against injustice or oppression, for reconciliation or the well-being of the earth; these are ways in which you add your candle flame to those of others and make a difference. Light. Eighty years ago, in 1931, a 25 year old student discovered the Sermon on the Mount. His name was Dietrich Bonhoeffer, and when I read today’s Gospel I immediately thought of him. He had just qualified as a university lecturer, and now he was on a year’s scholarship at Union Theological Seminary, New York. He became friends with a fellow student, Jean Lassere. Remember, this was just a dozen years after the end of the first world war. Lassere was a convinced .pacifist, and he encouraged Bonhoeffer to explore the Sermon on the Mount and reflect on what it meant to be a disciple of Jesus. Another friend he made in New York was Frank Fisher, who introduced him to a black Baptist church. It became his spiritual home, and he took a Sunday School class. Salt. The urban black scene of deprivation and struggle stirred him deeply. He would walk out of a cafe if it refused to serve his black friend. Light. Bonhoeffer returned home with a stack of records of spirituals in his trunk, and a determination to continue living out the Sermon on the Mount. As well as lecturing at the university he became chaplain of a technical college. He also took over a confirmation class in a slum area of the city, moving into a flat there for a while and taking the youngsters to a hut he owned in the country. Salt. Soon after Hitler came to power in 1933 he gave a radio talk warning of the dangers of a Fuhrer who becomes an idol of the people. Light. The next month, when an official boycott of Jewish shops began, he presented a paper to the church authorities on possible responses to the Jewish question including, if necessary, “putting a spoke in the wheel” of state activity. Light. In the summer he campaigned vigorously against the demand of those called German Christians that people of Jewish origin be excluded from the church. Light. Exhausted, he came to London in the autumn to look after two German congregations, but continued to advocate the cause of what became known as the Confessing Church, and he worked tirelessly for refugees from Germany. Salt. He returned to Germany in the spring of 1935 to take charge of an illegal seminary for ordinands. When the Gestapo closed it in 1937 it continued in a clandestine way. The lectures he gave there were published as “Discipleship” and “Life Together”. One section of “Discipleship” unpacks the Sermon on the Mount. “The disciples must not only think of heaven,” Bonhoeffer says of today’s gospel. “They have an earthly task as well …..A community of Jesus which seeks to hide itself has ceased to follow him.” Salt and Light. In 1939 Bonhoeffer travelled to New York to become a lecturer there, in order to avoid conscription and to be an overseas link for the Confessing Church. But almost as soon as he arrived he decided he had made a mistake. In his letter of resignation he wrote, “Christians in Germany will face the terrible alternative of either willing the defeat of their nation in order that Christian civilisation may survive, or willing the victory of their nation and thereby destroying civilisation. I know which of those alternatives I must choose, but I cannot make it in safety.” Light. So he returned home. Members of his family and friends had formed a resistance cell. He supported and encouraged them, and through them he was recruited as an agent of the Abwehr, the counter-intelligence agency. He used his visits abroad ostensibly to gather intelligence, but in reality to keep lines of communication open with church and political leaders in allied countries. Salt. He also helped with Operation 7 which enabled a number of Jews, recruited as agents, to travel to Switzerland and escape. Salt. In April 1943 he was arrested because of suspicion that he was using his Abwehr service to avoid conscription, and because of Operation 7. He was held in Tegel military prison in Berlin, and his calmness and practical care during the air raids at the end of that year made him something of a hero amongst both warders and fellow prisoners. Salt. After the failure of a plot to assassinate Hitler on 20th July 1944 and the discovery of papers implicating him and his circle, he was transferred to the Gestapo cells in the centre of Berlin, then to Buchenwald, and finally to Flossenburg. On the night of April 8th, 1945 he and six fellow conspirators faced a court martial. The next morning, April 9th, he along with rest was hanged with prolonged barbarity. Light. Bonhoeffer has been a source of inspiration to me for nearly fifty years. If you want to find out more, I commend the 100 page “SPCK Introduction to Bonhoeffer” by Keith Clements. As you follow Bonhoeffer’s story you realise that his way of living the Sermon on the Mount changed through the years. What it meant to be salt and light in 1941 was rather different to what it had been in 1931, and doubtless what it would have been in 1951 if he had survived the war. That is true for everyone. Being beatitude people in Wells today has a different complexion to what it was in pre-war or wartime Germany, or what it is in Cairo or Port-au-Prince or Seoul. What matters is that you and I work out what it means for us, here and now. “You are the salt of the earth. You are the light of the world.” Today on this ordinary Sunday, through the days of this coming ordinary week, through the weeks and years that are left to you, be the extraordinary people that you are.